Oh boy! 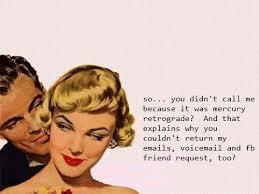 It’s Mercury retrograde time again. Dec 19th till 8th January to be exact . The planet of communication shifts its gear stick into reverse bringing its usual spate of communication and technology meltdowns travel delays, lost items as well as misunderstandings on a huge scale. Getting through this crappy three-week phase will take some effort – Mercury backstrokes through Capricorn then finishes in Sagittarius so we could start off this period with a lot more purpose or conviction and then may need to revisit our plans again and look at it from a higher purpose level . Power struggles and control issues could dominate relationships so practice the Pause or basically shut up. Is it really worth it? Are they even going to get it especially during this period? If you going to argue at least make sure you your points are valid and factual . Mercury retrogrades are famous for dredging up the past and all thing “ex’s”. All things “EX”are highlighted, which can make us long to reminisce about the past , reunite or reconnect. Exes or blasts from the pasts just seem to show up or align in your hemisphere sending friend requests , messages or random texts out of the blue. The trouble is that Mercury is Retrograde meaning that you have been warned that things may not turn out the way you expect . You might be rationalising a scene in your mind about connecting to an ex “since so much time has elapsed – that perhaps you could be mature adults and form a friendship now “. Getting closure or healing during Mercury retrograde may not be the right time. Mercury could give you a harsh reminder why they are in your past. https://www.marytarotreadings.com/wp-content/uploads/2016/09/MaryTarotReaderLogo-300x204.jpg 0 0 Mary Loughland https://www.marytarotreadings.com/wp-content/uploads/2016/09/MaryTarotReaderLogo-300x204.jpg Mary Loughland2016-12-19 00:54:502016-12-19 01:05:00Mercury Retro December 19- Help ! Archangel Michael Prayer of Protection WHAT DID I LEARN IN 2016?